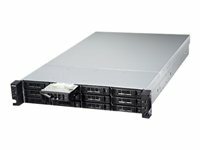 Buffalo’s TeraStation™ 7120r offers high performance, 12-bay network and iSCSI storage packed with advanced features and functions including IP camera and video surveillance support. TeraStation™ 7120r is ideal for businesses looking to implement a reliable RAID-based network storage solution for large networks and business critical applications. TeraStation 7120r features the Intel Xeon E3-1225 quad core processor, providing exceptional performance during file transfers and everyday NAS functions. TeraStation 7120r runs many services simultaneously and the quad core processor enables the ability to focus on concurrent tasks with minimal performance degradation: experience maximum network throughput while multiple replication and backup jobs run in the background and remote users are accessing content. 4GB of fast DDR3 memory installed. Supports any RTSP IP camera. TeraStation 7120r features Buffalo's replication technology providing easy and high performance data replication from one Buffalo NAS device to another Buffalo NAS device over the network or the Internet. This offers real-time synchronous replication of data, providing easy, continuous data protection in the event of data loss. TeraStation™ 7120r is bundled with 10 licenses of NovaBACKUP® Business Essentials, providing a complete, all-in-one data protection solution for small and medium businesses serious about protecting digital assets. Back up PCs, storage servers, Exchange servers and SQL databases. If ever you need to replace a hard disk drive (HDD), prepayment is no longer necessary and if the order is placed before 12 pm and in stock, shipment is dispatched the same day with a 24-hour delivery. 3 years with every TeraStation.